Can Liners Feature Accufit Sizing So They Fit Perfectly Into Common Cans With No Excess Plastic And No Falling Completely Into The Container. Each Can Liner Holds Up To 55 Lb. Or 44 Gallons And Offers A 0.9 Mil Thickness. Can Liners Are Designed For Use In Rubbermaid 44 Gallon Waste Containers (2643). Premium-Quality Prime Resin Resists Tears And Punctures. Can Liners Include A Natural, (Nonpetroleum-Based) Reinforcement Additive So Less Plastic Goes Into Landfills..
Can Liners Feature Accufit Sizing So They Fit Perfectly Into Common Cans With No Excess Plastic And No Falling Completely Into The Container. Each Can Liner Holds Up To 55 Lb. Or 44 Gallons And Offers A 0.9 Mil Thickness. Can Liners Are Designed For Use In Rubbermaid 44 Gallon Waste Containers (2643). 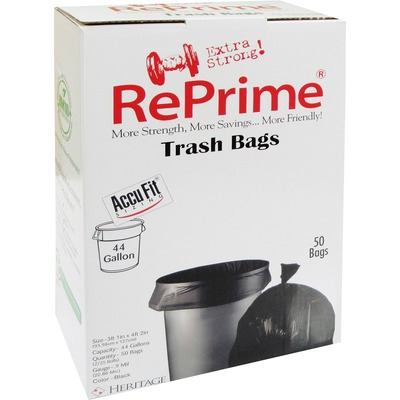 Premium-Quality Prime Resin Resists Tears And Punctures. Can Liners Include A Natural, (Nonpetroleum-Based) Reinforcement Additive So Less Plastic Goes Into Landfills.